Women's "White Aqua" 8s returning this Summer. Nike and Jordan Brand have plenty of women's sneakers in the pipeline for the coming months, including Nike's newly unveiled summer women's collection, as well as the brand new Jordan Air Latitude 720 silhouette. 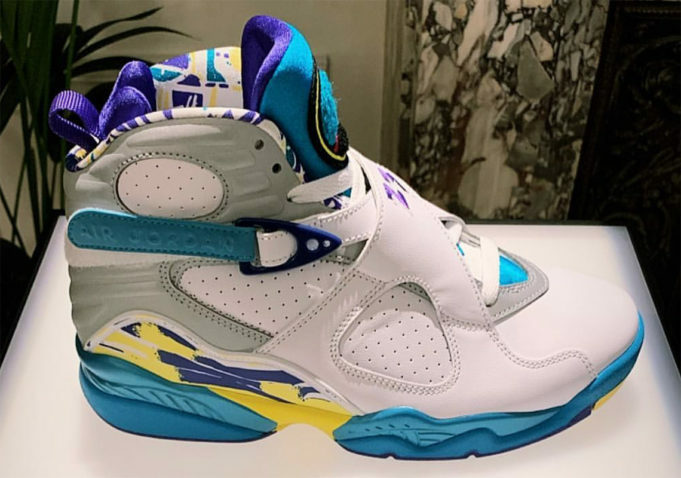 Additionally, there are several women's-exclusive Air Jordans in the works, such as the upcoming Aleali May Air Jordan 6 collab and the returning "White Aqua" Air Jordan 8. Check out the first image of the latter below, courtesy of Jordan Brand employee samantha_mbaker. The women's Air Jordan 8 "White Aqua" first debuted in 2007, featuring a "white, varsity red-bright concord-aqua" color scheme. Judging from early images of the 2019 rendition, the kick stay true to OG form. The kicks, priced at $190, are reportedly set to release as part of Jordan Brand's summer lineup on July 12. As of now it's unclear if they will release in extended sizes, but we expect to learn more details as Nike and Jordan Brand gear up for the next season of releases.